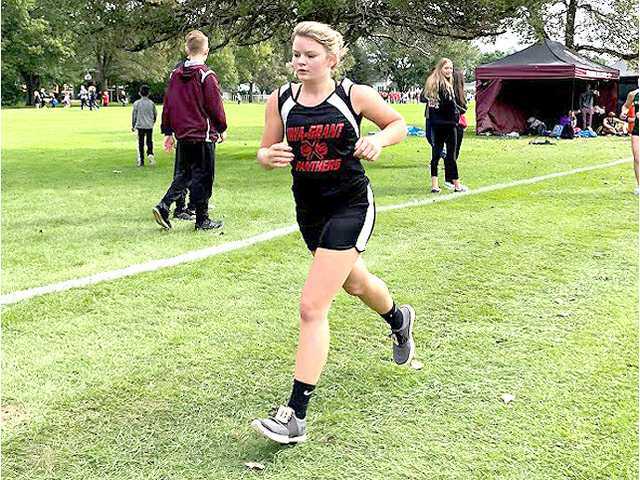 Junior Kylie Cutts finished her first career race, leading the Iowa–Grant girls with a 70th place finish at Saturday’s River Valley Blackhawk Invitational. POSTED September 14, 2018 12:02 p.m.
SPRING GREEN — The Iowa–Grant cross country team traveled to Spring Green Saturday for the River Valley Blackhawk Invitational. The Panthers boys’ team finished 15th out of 19 complete teams in the small schools varsity division with sophomore sensation Nick Connolly leading the way with a seventh place individual finish. Connolly crossed the finish line in 17:55 to earn a top-10 finish in a field of 129 runners. Junior Jesse Buroker (51st, 19:23), freshman Dylan Bingham (101st, 21:16), junior Sawyer Dobson (107th, 21:45) and sophomore Nic Pennekamp (122nd, 23:04) rounded out the I–G boys’ five-man lineup. Darlington senior Payton Heinberg won the small schools boys title with a time of 16:53 to lead the Redbirds to the boys’ team title. Darlington had six of the top 19 runners in the small schools division. The Iowa–Grant girls’ team was incomplete this weekend, with only four runners. Junior Kylie Cutts finished the first race of her running career, and lead I–G with a time of 24:55 to finished 70th in the small schools girls’ varsity race. Junior Sam McLeer (28:41) placed 100th, sophomore Brena Straka (29:57) was 103rd and junior Lexi Hildreth (30:20) finished 106th. Belmont did not have a complete team at the River Valley Blackhawk Cross Country Invitational. Junior Brady Johnston led the Braves competing at the meet by placing 40th overall in 19:16. NEXT: Belmont is off until Saturday, Sept. 22, when they will participate in the Fennimore Invitational, beginning at 8:15 a.m.
Small school team scores: 1.Lancaster 49, 2.Boscobel 74, 3.Prairie du Chien 99, 4.Darlington 103, 5.Viroqua 119, 6.Wisconsin Heights 154, 7.Albany 162, 8.Brookwood 178, 9.New Glarus/Monticello 285, 10.Belleville 288, 11.Fennimore 296, 12.River Ridge 308, 13.St. Ambrose Academy 342, 14.Hillsboro 361, Iowa–Grant inc.
Top individuals: 1.Abri Brown (Boscobel) 19:08.63, 2.Lydia Murphy (Lancaster) 20:08.39, 3.Ilse Mendez (Darlington) 20:13.30. Iowa–Grant (inc.): 70.Kylie Cutts 24:55, 100.Sam McLeer 28:31, 103.Brena Straka 29:57, 106.Lexi Hildreth 30:19. Small school team scores: 1.Darlington 47, 2.New Glarus/Monticello 77, 3.Boscobel 104, 4.Wisconsin Heights/Barneveld 150, 5.Wauzeka/Steuben 173, 6.Brookwood 209, 7.Viroqua 225, 8.Fennimore 239, 9.Lancaster 282, 10.Pecatonica/Argyle 287, 11.Palmyra–Eagle 308, 12.Belleville 323, 13.River Ridge 326, 14.Hillsboro 374, 15.Iowa–Grant 376, 16.Riverdale 394, 17.Albany 450, 18.Necedah 502, 19.Prairie du Chien 506, Belmont inc.
Top individuals: 1.Payton Heinberg (Darlington) 16:52.22, 2.Ian Barry (Fennimore) 16:54.03, 3.Christian Patzka (Wisc. Heights/Barneveld) 17:13.91. Belmont (inc.): 40.Brady Johnston 19:16, 75.Seth Peters 20:16, 108.Zachary Mester 21:48, 117.Tyler Simmons 22:37.